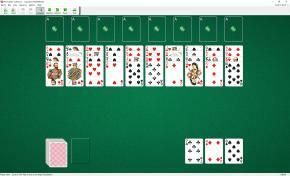 Squadron Solitaire uses 52 cards (1 deck). You have 10 tableau piles with 4 cards per pile. The next three cards are dealt to three reserve piles. Eight foundation piles are placed above the tableau. The top cards of tableau piles and cards from reserve piles are available to play. You may build tableau piles down in suit. Only one card at a time can be moved. When any reserve piles are empty you can fill the space with any card. Each reserve pile may contain only one card. When you have made all the moves initially available, begin turning cards from the stock pile to the waste pile. You can move cards from the stock pile to the tableau piles, to the reserves, and to the foundations according to the rules above. The rules state that you can move only one card at a time. 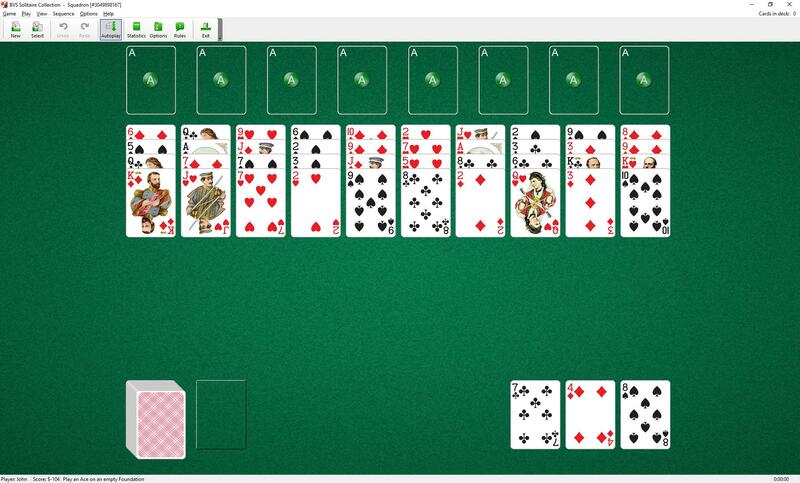 But as a shortcut, BVS Solitaire will allow you to move a full or partial build if there are enough empty tableau and reserve piles, because you would have been able to get the same result by temporarily moving the extra cards into the empty tableaus.